Fig. 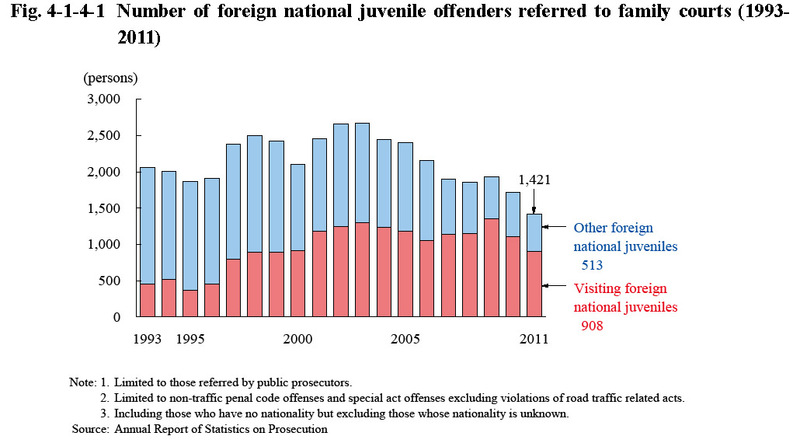 4-1-4-1 shows the number of foreign national juvenile offenders referred to family courts by public prosecutors (limited to non-traffic penal code offenses and special act offenses excluding violations of road traffic related acts) from 1993, and which is divided into visiting foreign national juveniles and other foreign national juveniles. Examining the number of visiting foreign national juvenile offenders referred in 2011 by nationality, etc. revealed that those from the Philippines were the largest in number at 222 (24.4%), followed by Brazil at 171 (18.8%), China (including Hong Kong and Taiwan; hereinafter the same in this section) at 157 (17.3%), South/North Korea at 86 (9.5%), Peru at 77 (8.5%), and Vietnam at 44 (4.8%). By type of offense, theft accounted for the majority at 489 (53.9%), followed by embezzlement (including embezzlement of lost property) at 144 (15.9%), injury at 89 (9.8%), breaking into a residence at 31 (3.4%), and Immigration Control Act violations at 21 (2.3%) (Source: Annual Report of Statistics on Prosecution).